Not been here for many years but still an excellent pub. Lots of ales and ciders from a variety of breweries (although meets the current trend of having predominantly light and hoppy beers). Good food and helpful and friendly staff. I was last here several years ago when I spent a little too long supping the various ciders. Ever since, it has been in my mind as the best pub in Cambridge. My visit yesterday only served to confirm that suspicion and the only question mark in my mind was whether to score it a 9/10 or a 10/10. 9 ales were on - Dark Star Hophead & American Pale Ale, Norfolk Brewhouse Moon Gazer, Three Blind Mice Half Wit & Juice Rocket, Mighty Oak Yellow Snow, Colchester London Porter & Woodfordes Wherry & Ruby Red. One local customer walked in and was also offered Incognito from the Crafty brewery, which wasn't officially on. Ciders and perry were Udders Orchard Luddite, Cromwells Oliver's Downfall, Hallets PX, Millwhites Rum Cask, Snails Bank Fruit Bat & Simons Sweet Barton Perry. The pub appears to have changed a little since I was there last. You are immediately greeted by fridges displaying a large bottle selection. To the right-hand side of the bar, you can see the cellar from where all ales and ciders were being dispensed direct from the cask. To the left is another small drinking area, with a larger extension beyond. I don't recall this area last time I was here. But I did have a few. There is also a large outdoor area, that was even in use yesterday. I think they had patio heaters. My conclusion is to rate this pub a 9/10, as there were a few vacant handpulls. Although this is hardly surprising for this time of year. 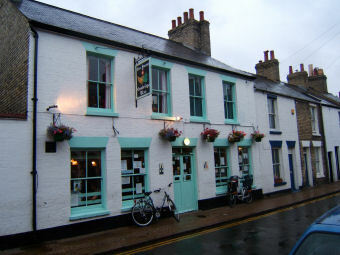 It's certainly the best of many decent pubs in Cambridge and also one of the best pubs in the country. Nice enough if a bit 'Cambridge twee' and faux foodie. Ale (Woodforde's Wherry) was a bit disappointing and lifeless though. A very nice well run pub,it was slightly off putting to enter and look at large bank of coolers and not be able to see the bar (left? or right?) a decent selection of real ales and a pleasant garden. Popped in before and after Plymouth Argyle's match this weekend. Excellent choice of both cask and bottled ales plus some good food as well. Pleasing to have a choice of bitters (Wherry, Nene Valley), plus a red rye ale which was different to the ubiquitous IPAs which seem to clog up most pumps these days. Nice beer garden out back too for sunnier days.